HR at Your Service will explain the ways that you--as an HR manager--can ensure that your team develops a strong appreciation for the power of anticipating and attending to the needs, wants, and expectations of managers and their employees first and foremost. Unfortunately, many HR departments lack knowledge of techniques for providing clients with true client-centric service. This lack of knowledge explains the failure of many HR departments in providing value-added services to help managers achieve their respective goals and the mission of the entire organization. Saying "we serve our clients" is one thing, but as made clear in this important book, benchmark service organizations make this commitment real in everything they say and do. Service-oriented HR departments know what makes them valuable in the eyes of all other managers and their employees. They take the time to learn what their clients need, want, and expect from them in order for their clients to be successful. They then demonstrate that their solutions to HR challenges are cost-effective, making HR's service meaningful and memorable. Knowing the behavior and actions that make a service encounter with HR memorable for a manager is what differentiates the HR department that has influence in crucial decisions from one that is merely "there" in the organization. "The customer-centric model that Gary and Bob skillfully layout in HR at Your Service is one that anticipates, understands, plans for, and proactively addresses the needs of business leaders, managers, and employees. What better formula for a successful HR department and its leadership?" "Becoming client centric is an important part of every HR professional's role. Using dozens of engaging examples that masterfully illustrate what truly effective service means, Latham and Ford provide a blueprint to help all of us improve in this vital area." "Latham and Ford insightfully apply principles of client service to human resource work. With wonderful cases from leading companies like Disney, Ritz, NORPAC, Southwest, Darden, Nordstrom, and Stora Enso, they show how HR can better find out what managers and employees need, want, and expect and then exceed those expectations. Their ideas are pragmatic, insightful, and helpful. This is a useful and good book." 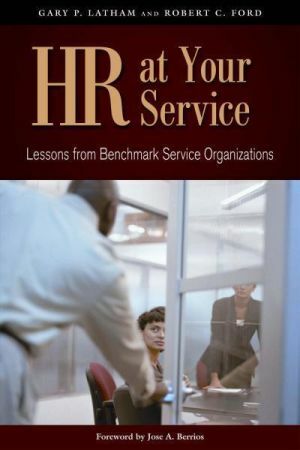 " ... an essential guide to incorporating client-centric service principles in HR management for those who aspire to be HR leaders in their organization." Dr. Gary P. Latham is Secretary of State Professor of Organizational Behaviour, Rotman School of Management, University of Toronto. He is the recipient of both the Michael Losey award from SHRM and the Herbert Heneman award from the Academy of Management's Human Resources Division for lifetime achievement in research that has made a significant contribution to the practice of HR management. He is a Past President of the Society for Industrial and Organizational Psychology as well as the Canadian Psychological Association. He is the President-elect of the International Association for Applied Psychology's Division 1, Work and Organizational Psychology. He has been awarded the status of Fellow in each of these professional organizations. Dr. Latham currently serves on the SHRM Board of Directors, where he chairs the Governance Committee. He is the author of several books, including Becoming the Evidence-Based Manager: Making the Science of Management Work for You (Davies Black/SHRM, 2009), which is also available from SHRM as an audio book. Dr. Robert C. Ford is a professor of management in the College of Business Administration of the University of Central Florida where he teaches management of service organizations. He is a former editor of the Academy of Management Executive and a recipient of the Distinguished Service Award from the Management Education and Development division of the Academy of Management. He is Past President of the Southern Management Association (SMA) and was awarded the status of SMA Fellow and the SMA Distinguished Service Award. He has published several books, including Managing the Guest Experience in Hospitality (2011) and The Fun Minute Manager (2009).